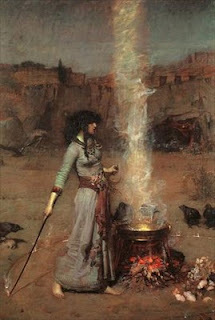 John W. Waterhouse, The Magic Circle. MaryCatherine Burgess, Associate Chaplain at the University of Edinburgh, in her book New Paradigm of Spirituality and Religion:Contemporary Shamanic Practices in Scotland, published by Continuum, illustrates a field research and case study on three shamanic practice groups in Scotland, among them astroshamanism. Burgess explores the historically difficult relationship between religion and spirituality by applying cross-cultural elements of shamanism and Daniele Hervieu-Leger’s analytical model of Religion as a Chain of Memory. In her work she uncovers a shamanic worldview that carries in its memory and practice a lineage of spirituality, not belief. This distinction sheds critical light on a new paradigm of spirituality and religion that reflects how many in Western societies currently respond to institutional religion. 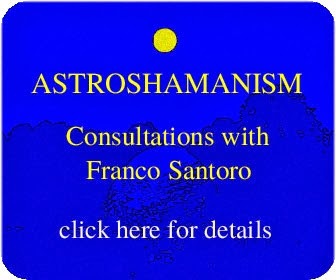 As for astroshamanism, Burgess describes her experience during two Franco Santoro’s workshops held in 2003, The East Gate held in Edinburgh and the Original Quest: An Astroshamanic Journey into Time and Space at the Findhorn Foundation. The book contains a detailed account of both workshops, interviews with Franco and an extended description of his shamanic approach, including his early years and initiation. We include herewith some excerpts taken from Chapter 6, titled “Exploring Connections Between Cross-Cultural Shamanic Elements and Neo-Shamanic Expressions in Scotland”. Here Burgess employs a model based on seven key elements existing cross-culturally on most shamanic communities, i.e. “vocation and initiation; cosmology; soul flight/journeying; consciousness; spiritual allies; soul healing; and community support.” In her field study she first explored the approach to, and understanding of, shamanism for each practitioner (Shamanism Defined and First Discovered), and then applied the above seven elements through questions relating directly to each of them. Shamanic vocation and initiation can occur in ways that typically include heredity or a spontaneous call; illness and/or dreams; death and resurrection experiences; and/or the bestowal of spiritual allies or a possible power song. Raised a Christian in Italy and later drawn to study yoga and astrology, Franco began to understand how apparently unrelated experiences throughout his early life were actually part of a long initiation and learning process for him. One of those early experiences had been the ability to “go through” a door and leave his parents without their knowing it. When that happened, he had a strong sense of déjà vu – that this was not new or unusual for him. While still a small boy, he also began to notice things that the adults either did not appear to see, or that they had decided should be only for adults, not children. Among the “things” he saw were the Bhi Jinah, spiritual beings that were to become friends and allies for him throughout his life. At about four or five years of age, he spontaneously began playing games that involved spending time in a different world – one with twelve states, for which he drew maps to describe them. In these maps, his family’s house became the world, and the various rooms in their house became towns or villages. The cosmology of this other world also developed its own mythology. There were even football teams with entire divisions. Each of the sectors in this world had a name, which Franco created as variations on family and environmental names he already knew. Though this was a creative way to integrate much of what he was learning in school, and it brought him great joy and ecstasy for many years, it was clear to Franco that this game was a fantasy. Shamanic cosmology initially refers to the distinction between ordinary and non-ordinary reality, but then further divides non-ordinary reality, or the spirit realms, into an overall geography that includes upper, lower and middle worlds. These non-ordinary realms are generally accessed from an ordinary-reality starting point on earth. These points are often associated cross-culturally with the axis mundi, the tree of life, because that image seems to portray the connection between all the “worlds”. Shamanic soul flight, or journeying, refers to the ecstatic experience of travelling into the non-ordinary realms of the spirit world and then returning to ordinary reality. The one journeying generally ascends or descends, though middle world journeys involve travel into the spiritual dimensions of what appears to be ordinary reality. On these focused and interactive journeys, one meets and works with spiritual allies who function as partners with the journeying in the provision of healing and/or information. Rhythmic music, drumming, rattling, chanting and dancing are typical ways of achieving a shamanic state of consciousness that facilitates the shamanic journey into non-ordinary reality. Other ways of assisting this process include the use of costumes and fasting. Spiritual allies in a shamanic context are experienced in a number of ways by humans who work with them. These allies form protective and supporting partnerships – becoming sources of power and guides to information and healing. They generally appear in human, animal and plant form; and in some cases, they unite with their human partners in a kind of spiritual marriage. As soul doctors, shamanic practitioners work on the soul level to help people in their healing process. Some of the classic methods of soul healing include: divining for important information; power animal retrieval; soul retrieval; extraction; helping people prepare for death; and performing psychopomp work for those who have died. Included in the concept of community support are aspects of a shamanic system in which members of the community somehow acknowledge that the call they recognize has come to a potential shamanic practitioner; support the work of that person by encouraging continued training and seeking spiritual assistance from the identified person; and monitor the effectiveness of the shamanic services that are provided. This may happen in different ways, depending upon the nature, size and location of the community.